Let’s get one thing straight. When you hear or read about the “gun show loophole,” you are reading a lie. Propaganda made up by those who want to take away your rights. According to Merriam-Webster, a loophole is, “an error in the way a law, rule, or contract is written that makes it possible for some people to legally avoid obeying it.” An error is “an act or condition of ignorant or imprudent deviation from a code of behavior” or a “mistake.” How we define a mistake is subjective. What some may find objectionable, others will find acceptable. 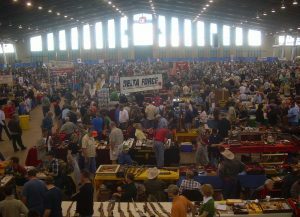 Gun shows are public events similar to a trade show where promoters rent public spaces and invite firearm dealers, knife makers and sellers of related products to display and sell their products. Admission is charged to enter the venue. The ATF estimates about 5,000 gun shows are held in the U.S. every year. Federal Firearms License (FFL) dealers must, by law, perform an FBI National Instant Background Check (NICS) on anyone who wants to buy a gun at a gun show. Any time someone wants to purchase a firearm from an FFL dealer, they must submit and pass a background check before the dealer can transfer the firearm to the buyer. This is law regardless of where the transaction takes place—at a gun show, online, at the dealer’s storefront, home or in a parking lot. It doesn’t matter. 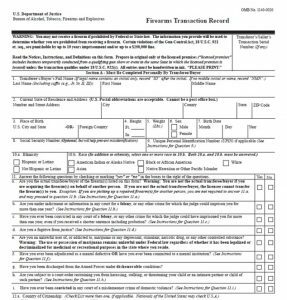 If an FFL dealer holds a license to sell firearms, they cannot legally sell or transfer a gun to someone without conducting this FBI background check. 1. You may not regularly buy and sell firearms for the sole purpose of gaining profit. 2. The individual buying the firearm must be legally allowed to own firearms. 3. 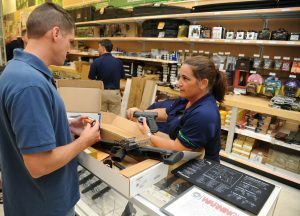 It is the seller’s responsibility—morally and legally—to ensure the firearm they are selling isn’t falling into the hands of a prohibited person. Is There Such Thing as a Gun Show Loophole? It has only been since 1998 that people have had to submit to and pass a background check to take possession of a firearm…from a licensed dealer. This law falls under the Brady Handgun Violence Prevention Act—also called the Brady Act or Brady Bill. The anti-gun group credited for helping get this law passed is today called the Brady Campaign to Prevent Gun Violence. The Brady Campaign’s roots were established over 40 years ago in a group called the National Council to Control Handguns founded by Mark Borinsky who was a victim of armed robbery. This organization were staunch supporters of handgun prohibition. Throughout most of the United States’ history, guns and gun ownership have never really been an issue—except for in our country’s early stages when British soldiers attempted to disarm the colonists…but that’s a different story—until fairly recently. On March 30, 1981, Jim Brady, President Reagan’s Press Secretary was shot during an attempt at an assassination on the president. Jim Brady became paralyzed for life. Soon after, his wife, Sarah Brady, spearheaded a campaign to get a background check system put into place. The President’s attempted assassinator was mentally ill, and Sarah believed that if he had gone through a background check, he would have never obtained a firearm. Nancy Pelosi, speaker of the House, helps introduce the new universal background checks act. On Tuesday, January 8, 2019, House Democrats introduced a new Universal Background Check law called the Bipartisan Background Checks Act of 2019. Former House Representative Gabrielle Giffords who was shot during a mass shooting helped introduce the bill. Like many other mass shooters, Giffords’ passed a background check and purchased his firearm legally. There is no way to enforce a universal background check when two private citizens decide to transfer firearms to each other because it isn’t necessary to alert any government body of the transfer of ownership. The only record kept of a gun sale in those states without expanded background checks (which is most of them) is when an FFL sells a firearm to someone. The thing is, NICS only pulls up information which is reported to the system. Currently, that is only federal convictions. State-level convictions and mental health adjudications are voluntarily submitted. States are NOT forced to send in their records. So, any unreported mental health record of an individual would STILL NOT SHOW UP ON A NICS report, regardless of a universal background check or not. For example, according to pro-gun control group Mayors Against Illegal Guns, 23 states and the District of Columbia submit less than 100 mental health records to NICS, 17 states submitted less than 10 and 4 don’t send any at all. So, Why Don’t They Fix That? President Trump signed the Fix NICS Act in 2018. This act penalizes government agencies that don’t report to NICS. There have been no further bills gaining traction addressing the discrepancy between state records and reporting. What Do Universal Background Checks Do? Law Center to Prevent Gun Violence attorney, Lindsay Nichols says, “This loophole means that dangerous criminals and dangerously mentally ill individuals have a most unfettered access to firearms.” However, based on the facts presented here, the Background Checks Act of 2019 doesn’t change that. And Senator Richard Blumenthal (D-Conn.) says universal background checks will “end the American epidemic of gun violence.” Since 80% of firearms used in mass shootings were purchased legally (according to left-leaning Mother Jones,) it is safe to say universal background checks will do nothing to prevent mass shootings. As it stands, if you still agree there is a “loophole,” then a Universal Background Check law isn’t going to fix bad people from doing really bad things. This is just another empty promise from a group of people who don’t understand the law. 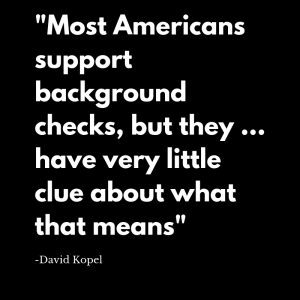 What do you think about universal background checks? Share your opinion in the comment section. 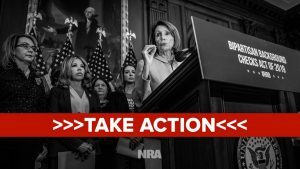 Click here to tell your representatives to oppose universal background checks.